The full conference schedule of presentations, papers, panels, workshops, and readings will soon be available. Until then, we hope this annotated list of "special" and elective events on each of the Conference days will provide a good taste of what you can expect at HNA 2015. There will be individual weblog postings here featuring the special events and key people, but links have been provided below to materials to inform and tease prospective Conference attendees. Leaf & Art Viewing Excursion to the Sterling and Francine Clark Art Institute in Williamstown, MA: Our tour bus(es) will leave The Desmond for this pre-conference event at 9:30 a.m. and drive 50 miles along beautiful Route 2 (with opportunities for photo-taking) to Williamstown, MA, where we will spend three hours at The Clark. Known for the quality of its art and its beautiful pastoral setting, the Clark describes itself as "one of only a handful of institutions globally with a dual mission as an art museum and a distinguished center for research and higher education, dedicated to advancing and extending the public understanding of art." It is "Surrounded by 140 acres of expansive lawns, meadows, and walking trails", with views of Williamstown and the Green Mountains of Vermont. In an article describing the quietly stunning new wing designed for the Clark by Pritzker Prize–winning Japanese architect, Tadao Ando’s, Architectural Digest says "Long a destination for in-the-know art lovers searching for a mix of natural and artist-made beauty, the Clark is now more enticing than ever." The Tour fee includes entrance to the Art Institute. The fee, including museum ticket: $50, payable with registration. 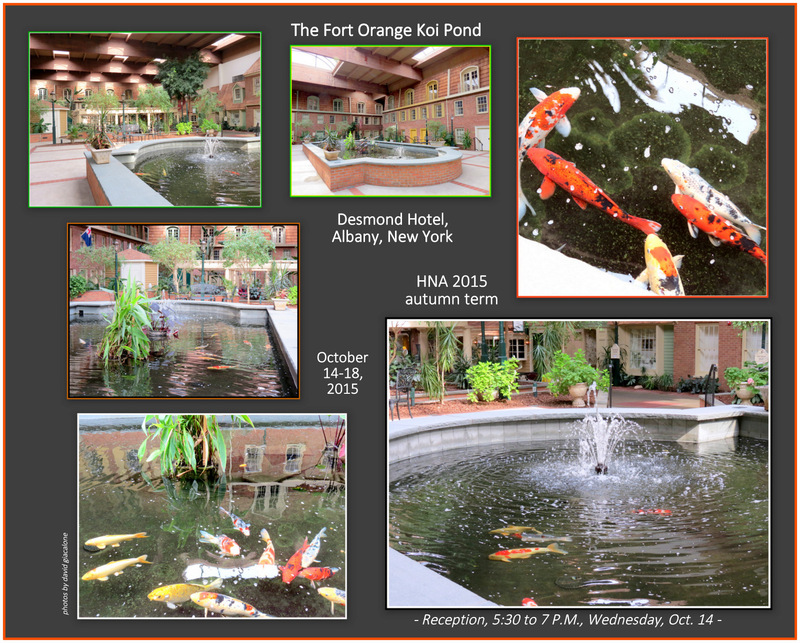 The HNA 2015 Conference begins at 6:30 pm with a Reception at The Desmond's Koi Pond . You want to be there! Keynote address, "Teaching Haiku in American Higher Education," by Dr. Randy Brooks, the Dean of the College of Arts & Sciences and Professor of English at Millikin University in Decatur, Illinois. Panel Discussion with Aubrey Cox, Tom Painting, Geoff VanKirk (United Nations International School), and Rich Schnell (emeritus faculty of SUNY Plattsburgh), moderated by Michael Dylan Welch. An afternoon reception presenting Ion Codrescu's haiga exhibit in Mandeville Gallery of the Nott Memorial. You will find a biography and Gallery of Ion's work at Simply Haiku. See our July 26 posting for more information. An evening presentation by Red Pine. Under his own name, Bill Porter has published several books describing his travels in China in search of what remains of the Taoist/Buddhist hermit tradition; he is even better known, as Red Pine, for his translations of Chinese poetry and of the major Buddhist texts. Kyoto Journal has an enjoyable introduction to his work, "Dancing with Words: Red Pine's Path into the Heart of Buddhism." When class lets out on Friday afternoon, you will be on your own for socializing and dining in Downtown Schenectady, with its many and varied cafes, restaurants, taverns and such. (information on dining choices will be available at the Conference and Desmond) You may, for example, want to visit the nearby Stockade Historic District, a half mile from the Union Campus, which has several restaurants, and what the National Park Service calls "the highest concentration of period homes in the country" (over 40 of the homes are more than 200 years old) along its 15 blocks, plus the lovely Riverside Park hugging the Mohawk River. See David Giacalone's description, photos and preview of his Stockade neighborhood in October in the Schenectady Stockade and October along the Mohawk at Riverside Park, and thousands of other Stockade images at his website "suns along the Mohawk." A Candlelight Walking Tour of the Stockade Historic District, sponsored by the Schenectady Heritage Foundation and the Schenectady County Historical Society. A tour guide will lead the hour-long adventure, with tales of ancestors, apparitions, intrigue and more, garnered from 300 years of history and neighborhood lore. The tours start at the County Historical Society, 32 Washington Avenue, and return there for refreshments among the Society's museum exhibits. The $10 fee is payable the evening of the Tour. (David Giacalone will join the tour from his Washington Avenue home, and treat it as a Halloween Ginko.) You can get a taste of the Candlelight Walking Tour at the Historical Society's website, in the posting "Exploring the Haunted Past of Schenectady's Stockade". Renku for Fun led by John Stevenson, at historic Arthur's Market and Coffee House in the Stockade. Renku, Fun, John. Enough said.